Music biopics are a difficult sub-genre to do well. Most of them are lifeless, and made specifically for the fans that already know the intricacies of the backstory, and could sing along with all of the music. Films like Jersey Boys (2014) and The Runaways (2010) certainly have their audiences, but to most the films amount to very little. 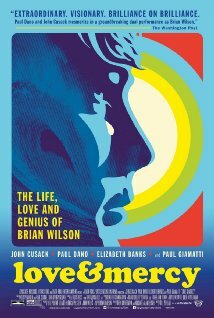 Love & Mercy, which chronicles most of Brian Wilson’s career, is drastically different, and earns its rank among some of the greatest music biopics like Control (2007), Sid and Nancy (1986), and Walk The Line (2005) to name just a few. The film is a dual narrative that covers both young Wilson’s (Paul Dano) creation of Pet Sounds, and also older Wilson’s (John Cusack) fourteen or so months under the guidance and strict surveillance of the radical, maniacal therapist Eugene Landy (played by Paul Giamatti). At first I was hesitant that the film had two Brian Wilsons. I am typically not a fan of total recasting for older and younger roles unless the age difference is too great. But, what can I say? Both Paul Dano’s and John Cusack’s performances are outstanding. Just like younger Brian Wilson is radically different than older Brian Wilson in many ways, so are the two actors. Dano captures young Wilson’s capricious, unstable, and brilliant tendencies, whereas Cusack portrays the subdued, emotionally injured, endearing older Wilson. In fact, it’s Cusack’s best performance in easily a decade. The film opens completely black with a swelling of noise—starting with hints of The Beach Boys and ending with a swarm of unrecognizable noises, immediately setting a radically different tone than most glossy, Hollywood biopics. After seeing someone, an older Brian Wilson we can assume, lying in a bed surrounded by trash, laundry, and food we quickly move on to a series of “archival” videos during the opening credits. The archival videos are in fact shot today, but due to the fact they were shot on 16mm film they make Paul Dano and the other cast members look straight out of 1960. The film really starts its story in the mid 1960s, after The Beach Boys’ major studio hits (think any song with “surfer” in it), just as Brian Wilson begins creating Pet Sounds. This is the perfect starting point, as Pet Sounds was Wilson’s very own masterpiece, which he worked against everything to finish. From disapproving bandmates and a bitter, abusive father (who basically tells Wilson “God Only Knows” is a joke of a song), Wilson somehow perseveres. The greatest moments are the scenes where Wilson is in the studio creating the orchestral movements (and more unconventional sounds) for the album while the rest of the band is out on tour without him. You don’t have to know the songs of Pet Sounds, but if you do, it adds a truly incredible layer to the film. Wilson places bobby pins on the piano strings to capture the perfect twang for the intro of “You Still Believe in Me,” and spends hours having two bassists playing the same exact baseline in a different key for “God Only Knows” again and again until it sounds just how Wilson pictured it would in his head. He also riles up dogs to get them barking and howling, and even poses the question if a horse would be able to fit in the studio. The scenes with older Wilson meeting and falling in love with his now wife Melinda Ledbetter (played by Elizabeth Banks), are often tender, and Brian Wilson himself has commended the film for its accurate depiction of his love for his wife. Giamatti also performs well, though his abusive, unstable character is not one he hasn’t played before. With any biopic no matter how long and detailed, certain areas are played down, or entirely glossed over. Love & Mercy is not immune to this—the other Wilson brothers are barely focused on, for starters. Additionally, the tenuous relationship between Wilson and Landy is not fully fleshed out. Though Wilson’s drug use is certainly highlighted, the film never fully dives into the discussion of illness or addiction. Regardless, this film shines—brightly. Whether or not you are a Beach Boys fan is irrelevant. If you have respect and admiration for music itself, this film will not disappoint. I have had Pet Sounds and Smile on constant rotation since I saw this a few weeks ago. Love & Mercy opens today in Philly area theaters.